The firm has been active and also at the fore front of solar for over 30 years. The Oil Crisis of the 1970's was when SunPower drew its first breath. This was the time that founder Dr Richard Swanson also started looking at new ways to make power. Since those days, SunPower is now the World’s most famous solar maker. Though other firms make a lot more panels, no one has made a better panel. For a long time now, Sunpower's work has in effect earned respect for build quality. So, the panel we use the most is the Sunpower 327w E-20. No other solar panel exists that is better in any way or made from better parts. 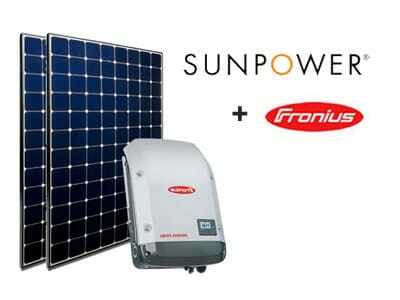 Sunpower E-series deal with shade better than standard panels too. They deal with shade better than standard panels also. How this works in fact is by having less electrical “hot spots” on the panel, giving more power. In Effect Puts The LID On Things. LID or Light Induced Degradation is in fact quite bad for solar panels. By placing the panels in a cloud of phosphorus or boron gas they are then able to make power. Over time, sun light breaks down panels made with the “P-Type” silicon process, this method in fact uses boron gas. The “N-Type” silicone process in fact uses just phosphorus gas and sun light does not harm it. This is what SunPower uses then to make their panels. The copper contacts that run inside the panel are a lot better than the plain 'ribbons' too. Ordinary panels just use a 'ribbon' type which is OK, but not the best you can get. Panels are heating up or cooling down and so copper deals with this better. They also are able to deal with heat better due to their build and the materials used in them. This is in fact up to 1.5% better on some models than other panels. This means then that on hotter days, their output is less affected too. Other panels have their connections at the front of the panel, but SunPower have theirs at the rear. The look of the cell is then 'clean' as the 'silver ribbon' connectors found on other panels are not there. They in fact cause shading in side the panel too, and the output is less. Humidity is bad for panels and so over time it will affect them all. SunPower aim to make this less of an issue in effect by the use of better design and build. It’s fair to say then that SunPower panels wont suffer from moisture issues for a long time. You'll be happy to know that SunPower panels will take up less room on your roof while being so efficient. This is of course crucial where there is less usable roof area. Most panels are quite fragile and so poor handling can create problems like 'micro cracking' in them. These panels also have a thick copper base too which adds a lot to its strength reducing chance of damage. SunPower E-series has a 25 year warranty on its panels in fact not matched by any to this day. The guarantee is at least 95% of rated output for 5 years, and at least 87% at 25 years. This is a great warranty that covers in fact all costs of replacing the panel. So to find out more details get in touch with SunPower as there are some conditions. SunPower is not quite alone at the top of the market, and so shares this space with LG. Although, the LG is in many respects as good, the great SunPower warranty gives it a big edge. So if you are the kind of customer that wants the best with the longest, then this is your panel.